Sarajevo Views – October 18, 2009, originally uploaded by bill kralovec. I took this photo from a hilltop above Olympic Stadium in the northern suburbs of Sarajevo. 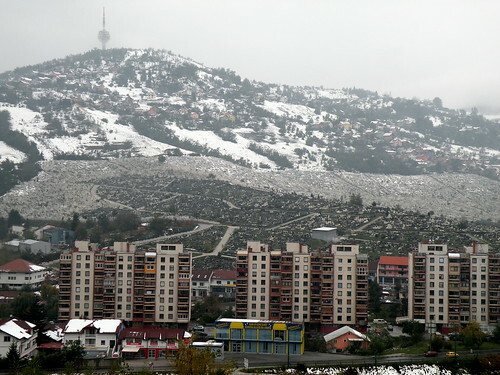 The large gray area above the apartment buildings and below the snow is a cemetary of war dead. The siege of Sarajevo lasted over 4 years and over 11,000 people died. What a horrible waste! The cemetary pictured is only one of many. 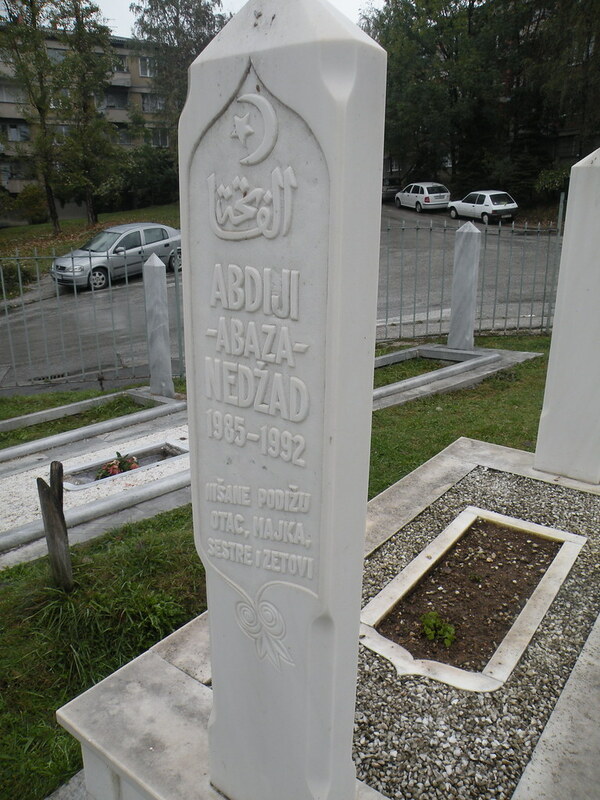 The grave to the left is of a seven year old Bosniak. Most of the tombstones had deaths from the time of the siege. One of the horrible characteristics of the war in Bosnia was the heavy involvement of civilians. The fighting in Sarajevo was especially disturbing. There were few traditional front lines or strategic geographic points like a river or mountain top, but mostly building to building and apartment to apartment exchange of fire. I can’t believe so many non-combatants were trapped in the city. It sounded like from what I have read and from what people tell me is most ordinary citizens didn’t think there was going to be such a level of violence. The photos, videos, and accounts of the war are shocking. 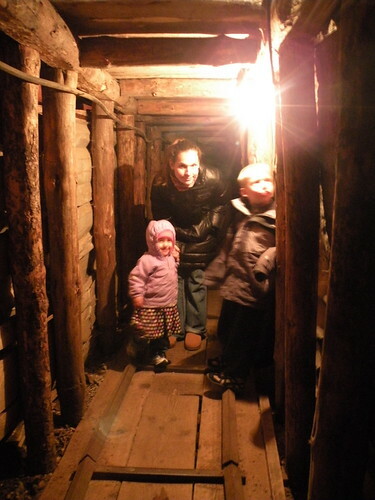 It was interesting to look for and experience the effects of war 15 years after it occured. I have visited battle sites before, like the Battle of Carabobo site in Venezuela. They were hundreds of years after the fact and seemed like ancient history. This was fresh. I wonder if this is what my father felt as he served in the US army of occupation in Germany in the early 1950’s. The devastating effects of WWII must have been all around him, not only in the buildings, but in the people also. Most of the people we talked to in the city were very nice and I didn’t ask much about the war. I thought that it would be too personal, especially questions coming from a tourist. I loved the city of Sarajevo. The mosques gave it an exotic touch, the mountains and ski areas around the city are beautiful, and the markets and friendly people make it a very cool place to visit. 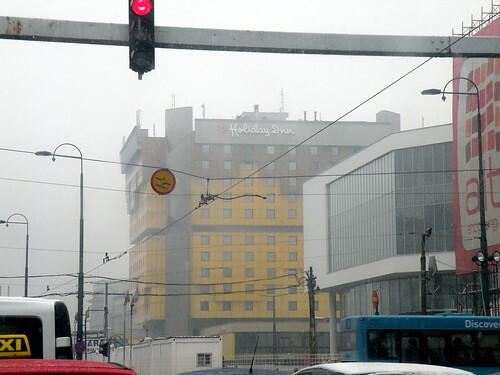 The older part of the city was crowded and parking was difficult. It will take a long time for the city to shake the effects of the war. The pre-war ethnic mix is now gone, with most Serbs leaving. The city is still great, but with the emotional and physical scars of war in the buildings and people, it is less of a city. The Dayton Accords ended the war and it divided the country by the frontlines between the Bosnian Serbs and the Croats/Bosniaks. It is still one country, but divided into “cantons” which in my mind are basically countries. I was interested in how the Republika Srpska (RS) would be. RS is mountainous and beautiful. I saw one Bosnian flag while seeing in every village, huge Serbian flags without the coat of arms. The Bosnian flag was flying in a park made with EU money. In a few of the towns were new mosques, obviously built with money from the Middle East. The trip made me think about the Serbs of Bosnia. I got the impression that they were the “country cousins” of the Serbs. I suppose it would be like the differences between the New Yorkers or the people of Boston and Texans. What both Bosnia and the Republika Srpska need are more money. With a better economy, people would have other worries besides ethnic or religous differences. As my friend in Belgrade said, “give them mortgages and bosses, and they will forget to shoot at each other.” He also said that before the war, there were more similarities between Bosnian Serbs and Bosniaks that between people the Bosnians and people in Belgrade. The war and afterwards made people express their differences more. As Barak Obama said, it is harder to find our similarities than our differences. I hope to return to Bosnia again. 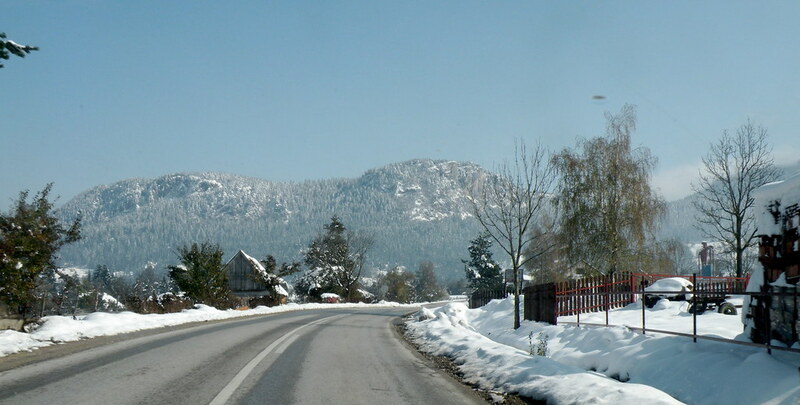 I would like to go skiing there, see the Catholic shrine of Madjure (spelling) and the coastal area and highlands of Hercegovina. i think u didn’t understand some things well .